When building or remodeling, owners are faced with a myriad of confusing choices, not the least of which is what material to use for their kitchen counters. Among the many preferred options are: granite, solid surface material, butcher block, concrete, and marble, specifically Carrara marble. It won’t stay pristine for long: Marble is easily scratched and stained. You can’t chop vegetables directly on it as acidic liquids will stain the surface permanently. Marble is more porous than natural stones or solid concrete. It can be seriously tricky to clean: Acidic liquids of any kind, including organic cleaning products, are bad for marble. Cleaning requires a special kind of cleaner which can cost at least $10 for 16 ounces. It requires extra work to protect it: A seal can help protect your countertops, but it requires regular maintenance. The recommended resealing process is every 3 – 6 months to maintain the luster and prevent staining. It can be bad for resale: In five to ten years this product is likely to look very different and be less appealing to a prospective buyer than any other stones, which may age better with less maintenance. Some lifestyles present additional reasons to resist the urge to install marble, for instance: if you use the kitchen heavily, if you have children who will be eating or playing on the surface, or if you don’t have the interest/time for the maintenance it requires. 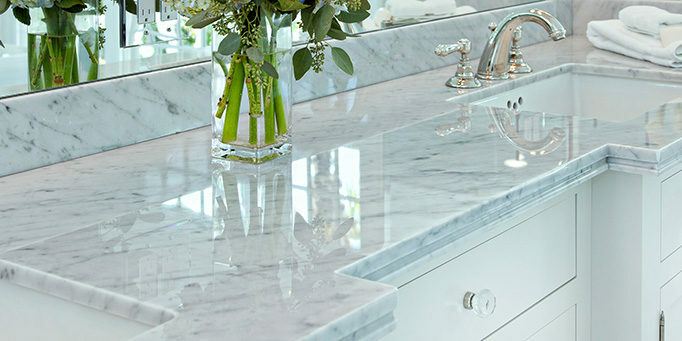 If you are a fan of HGTV shows, you would think that Carrara is the “go-to” for every project, and they do look beautiful when they are first installed. What you don’t get a chance to view is what Carrara looks like after the family has lived in the house for any length of time. With all the other options out there, maybe foregoing Carrara isn’t such a difficult decision. The moral of this article is: Study up on your preferred material for countertops before you buy them. You want to make sure you’ll be happy with it for years to come, as it is your home! If you’re doing renovations or interested in alternative financing for your home or rental, call us today (707) 523-2099!